Host defenses such as anatomic, functional, and mechanical barriers serve to protect the intact bronchial tree from invading organisms. Some key factors in the pathophysiology of community-acquired pneumonia are alterations in host defense mechanisms, invasion by virulent microorganisms, and the quantity (i.e., inoculum) of the invading microbes. 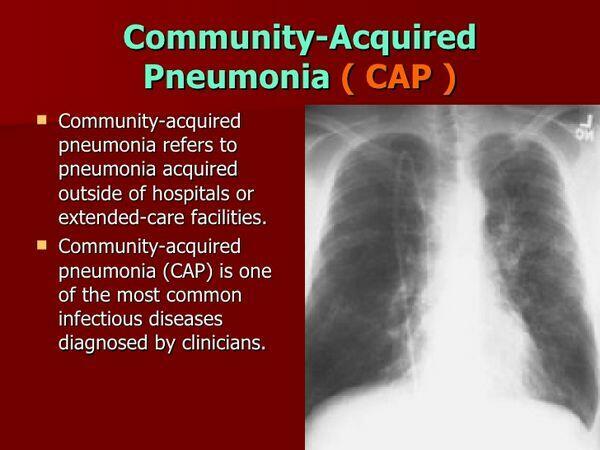 community-acquired pneumonia is usually acquired by inhalation or aspiration of pulmonary pathogenic organisms into a lung segment or lobe. Much less commonly, community-acquired pneumonia may result from a secondary bacteremia from a distant source — for example, community-acquired pneumonia secondary to Escherichia coli urinary tract infection and/or bacteremia. Several host defense mechanisms combine to create a generally sterile environment within the lung. Protection of the lung from infection begins with nonspecific defense mechanisms in the upper respiratory tract. Large inhaled particles are frequently caught in the nasal hair. Particles that pass through the nasal hair may be filtered out in the turbinate baffles (curved bones within the nasal cavity), which catch large particles and prevent them from moving lower in the respiratory tract. Mucus lines the entire respiratory tract and traps potential pathogens, which can then be expelled by various means, including the cough reflex. The ciliated cells of the trachea can transport particles trapped in mucus from below the larynx upward until they can be swallowed for destruction in the gastrointestinal tract. The epiglottis prevents fluids and food from entering the respiratory tract during swallowing, thereby preventing the descent of pathogens into the lower respiratory tract. The salivary glands protect the respiratory tract as well by secreting several nonspecific bactericidal proteins, including immunoglobulin A (IgA) and lysozyme. Despite the many mechanisms protecting the lower respiratory tract, pathogens can infiltrate the lung and establish infection. Bacteria typically reach the lung when infected aerosols or aspirated secretions from the upper respiratory tract are inhaled or, much less commonly, through the bloodstream from another site of infection. Aspiration is the most common route of infection that occurs in the respiratory tract. Normally, the host defense mechanism clears out any aspirated foreign microorganisms from the lower respiratory tract. An infection usually occurs when one component of the defense mechanism is not functioning properly. This malfunction results in microbial colonization of the upper respiratory tract. Once infection is established, immune responses develop, leading to a suppurative (pus-forming) reaction. In pneumonia, the alveoli, or airspaces of the lung, fill with exudates as a result of the immune response to inflammation (discussed later). The pathology that develops in the lung during the course of pneumonia is an important clinical manifestation that, to some extent, helps to differentiate possible causative pathogens. Cellular immunity and humoral immunity also play important roles and can help protect the body from bacterial organisms. The alveolar macrophages secrete numerous cytokines, which recruit neutrophils to the site of infection. Neutrophils are the primary cells responsible for the destruction of bacterial pathogens in the lung; they are the abundant immune-cell type in the majority of infectious pneumonias. The antibody response to infection, typically involving the development of IgM during the initial acute infection, followed by IgG, is one of the most important pathogen-specific responses and plays an important role in diagnostic evaluation. The complement cascade is often mediated by the development of antibodies and is important in the destruction of pathogens. For intracellular pathogens (e.g., Legionella pneumophila), which replicate within the alveolar macrophages and are not exposed to neutrophils in the extracellular environment during replication, the cell-mediated immune system (which targets intracellular pathogens) is responsible for destroying infected cells. Both CD4+ T cells and CD8+ T cells are involved in this type of response, but the exact nature of this response is unclear. As previously discussed, the classical clinical presentation of "typical" pneumonia includes fever, cough with sputum production, pleuritic pain, and chills, while "atypical" pneumonia is associated with any number of systemic symptoms, including myalgia (muscle aches) and headache. Confusion and personality changes attributed to hypoxia (below-normal levels of oxygen in gases, arterial blood, and tissues) can also occur in elderly patients. Patients with atypical pneumonia may often have only mild respiratory symptoms. In addition, pneumonia due to infection with so-called atypical pathogens can present as typical pneumonia, and atypical pneumonia can be caused by bacterial pathogens thought to cause only typical pneumonia. Presentation of disease may depend not only on the pathogen causing the disease but also on the host. Elderly patients with pneumonia, for example, can present with very mild respiratory symptoms because the cough reflex is diminished. Patients may also appear sunken and dehydrated because of their inability to eat and drink, which results from an inability to breathe properly. Therefore, the clinical presentation of pneumonia is often of little diagnostic significance in terms of differentiating among the numerous possible bacterial pathogens that can cause disease. 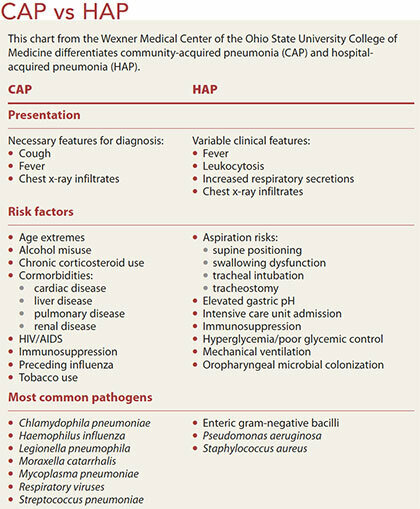 Common, significant, and life-threatening complications associated with community-acquired pneumonia are sepsis (a syndrome resulting from bacteremia, characterized by marked hypotension progressing to multiple organ failure), septic shock, respiratory failure, pulmonary embolism, congestive heart failure, cardiac arrhythmias, myocardial infarctions, renal insufficiency, stroke or transient ischemic attack, and invasive suppurative infections such as empyema (purulent fluid in pleural tissue) and brain abscess. The progression to severe pneumonia can result in respiratory failure requiring admission to the intensive care unit (ICU). The combination of bacterial replication and immune response can lead to severe tissue destruction, which can result in the accumulation of scar tissue and, consequently, permanently diminished lung function. Diffuse damage within the alveoli can prompt acute respiratory distress syndrome, which is often fatal. One of the most serious complications of pneumonia is the progression to bacteremia (the presence of bacteria in the blood) because pathogens that have spread to the blood can cause sepsis and eventually death. Bacteremic pneumonia occurs in approximately 10-20% of pneumonia cases caused by S. pneumoniae and is associated with a two- to fivefold increase in mortality rate. Mortality from pneumonia usually results from the complications of sepsis. Although current treatment is very effective for community-acquired pneumonia, the mortality rate remains high primarily because once sepsis develops, patients frequently become refractory to treatment. The mortality for bacterial community-acquired pneumonia ranges from 1 % for outpatients to 35% or greater for hospitalized patients (for example, in the ICU). An estimated 90% of deaths resulting from pneumonia occur in people aged 65 or older.